Peter Tesar Architectural Design - What is the difference between a Septic tank and a Cesspit? 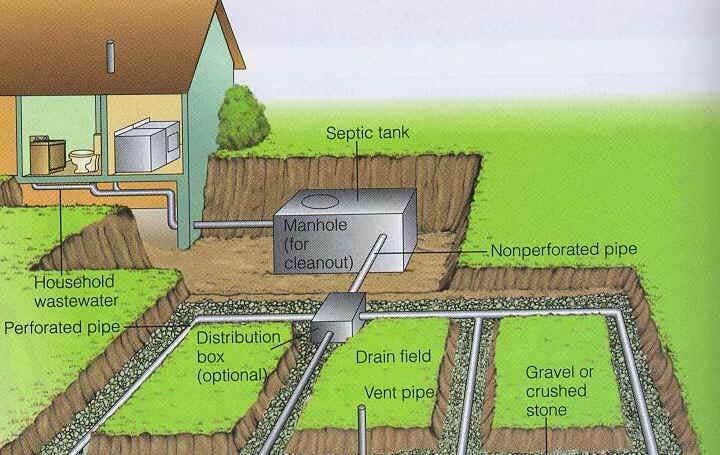 A septic tank is generally in the capacity regions of 6-9000ltrs, it collects all water and solid wastes direct from the house / building. It then separates the solid mass from the water and disperses the water via perforated pipes under the ground just like a soakaway. A cesspit is a more straight forward system. This is generally a larger tank in the capacity of 29,000ltrs+, it equally collects all water and solid wastes direct from the house / building but stores the entire content in readiness to be emptied. The formation layout of the pipes, also the necessary length of the pipes very much depend on the ground conditions (i.e. how long it takes for the water to drain) to find this out, a percolation test is carried out which is basically a cubed hole excavated and filled with a given quantity of water and it is then timed to see how quick this water drains, and it is the time taken which determines the length of pipe required. There are systems available which offer a very green alternative and can disperse into natural waterways if located near by, but this method is extremely monitored and regulated with strict criteria, and rightfully so! A cesspit is a more straight forward system. This is generally a larger tank in the capacity of 29,000ltrs +, it equally collects all water and solid wastes direct from the house / building but stores the entire content in readiness to be emptied. This system is generally used where there is not enough ground space to excavate and lay distribution pipework for a septic tank, or the ground conditions may prohibit any drainage and therefore water dispersal may not be feasible. Clay subsoil is known for this. More information regarding a percolation test can be found just by simply using your search engine on the good old World Wide Web!